She’s also pitching in to help with Empower Nail Art owner Lucien Henderson’s concept of non-product-focused nail education. Called The Nail Platform, a group of educators including Henderson, Schippers, Silvestro, Naja Rickette, and David Valentino recently pulled together a day of learning on a variety of topics from acrylic and gel techniques to business building skills in Anaheim, Calif. 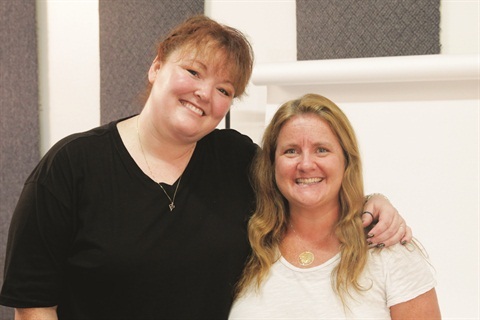 The group is also committed to improving the trade show experience for nail techs after realizing many of the big beauty shows don’t put enough emphasis on nail professionals. “Hopefully there will come a day when people feel comfortable and confident to attend education, learn to improve their skills and business acumen, and elevate the industry together,” says Schippers. 1. After you’ve prepped the nails thoroughly, apply CND Shellac Base Coat and cure in the Shellac lamp for 10 seconds. Apply CND Shellac in Wildfire and cure for two minutes. Repeat to apply a second coat of Wildfire. DO NOT remove the top film after you cure the second coat. 2. Cut freehand shapes out of Empower Nail Art MsPrints and apply them to the nails. Make sure to smooth the MsPrints down tight to the nails. 3. Burnish CND Additive Gilded Gleam onto the nails being careful not to lift up the MsPrint with the brush. Gently brush out any loose additive from the margins and edges. 4. Peel away the Empower MsPrints carefully. 5. Apply a thin coat of CND Shellac in Clearly Pink to protect the Additive layer and cure for two minutes. 6. 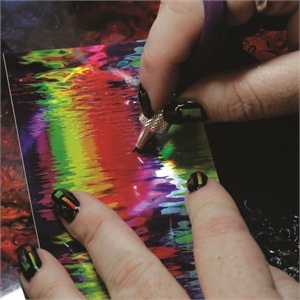 Cut freehand shapes out of Empower Nail Art film in Rainbow and apply randomly to the nails. 7. Smooth the Empower film down to the nails and trim off any excess in the margins, cut off excess on the extension edge with a crystal file. 8. 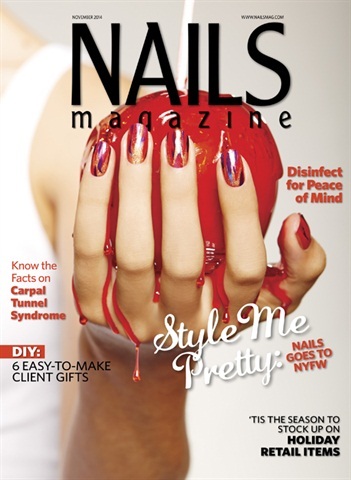 Seal the nails with CND Shellac Top Coat and cure for two minutes. Remove the top film with 99% IPA and massage in Solar Oil.